Howard Boyd is not one for mincing his words. "Tracy Emin and her unmade bed is to me a very lazy piece of work. 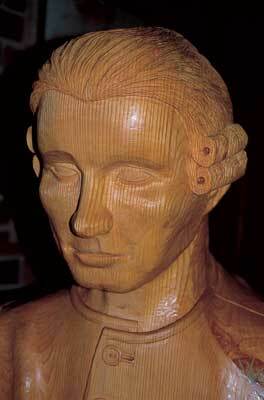 If she had rendered her message in a medium other than her own soiled waste, perhaps it would have had more to say," he ventures, adding: "One suspects it wouldn't have attracted the same disdain had it been carved life-size in English walnut." Note the word 'life-size', for it is OH Boyd's stock in trade, his raison d'etre. He explains: "In my view carvings in wood have to be big in order to show their power. Whilst I thoroughly admire the delicate work of the netsuke carvers, for me the energy and aura of the work increases dramatically with its size." He goes on: "Working so large presents its own problems, not just in terms of the volume of work; everything goes up exponentially, from the stresses and strains of the material, through cost and weight, to the awe of the piece." Howard was born and bred on the banks of the Humber, and still has a studio there, at Horkstow, near Barton-upon-Humber, North Lincolnshire. At the age of five he stole into his father's workshop and carved a small flight of steps from some scrap wood, being as fascinated by the grain, texture and smell of the wood as he is today. He trained as a draughtsman and graduated to technical illustration and design. Later in life he ran his own design workshop for 15 years. 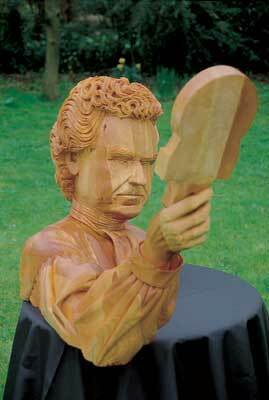 After tragic bereavements he decided to specialise in his first love, carving. His work is characterised by extreme attention to detail and intensive historical research. He teaches several classes on both banks of the Humber and gives private weekend residential tuition in his beautiful farmhouse. He is currently working on two large carvings to provide a focal point for a major art collection, and on two ships' figureheads, one for Captain James Cook's sloop, The Resolution, being built in Whitby, and the other for the Sail Training Association's new ship, The Stavros S Niarchos. 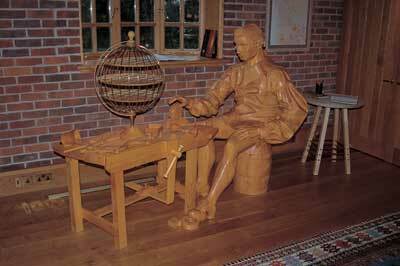 His recently completed work includes Longitude, an amazing sculpture of John Harrison who invented the longitude clock, the Harrison King bust of Andrew King, who replicates Harrison wooden clocks, and the 7ft-tall Hector Horses. Howard started Harrison King by observing Andrew King's habit of inclining his head and having a slightly oblique look when absorbed in and examining something. He then drew a life-size outline onto a large sheet of ply. The outline was then transferred to the pattern board. "The attitude I chose is of a bust 1 3/4 times life-size with one arm extended. Andrew is a bit of a dandy and it looks at first glance as if he is admiring himself in a hand mirror; not so. He is wearing the stock he wears for his Harrison lectures, and pinched for the film Longitude, in which he appeared. "The stock is carved as an outpouring of knowledge from him, almost in the form of a river. The shirt he is wearing is the one I used for the Longitude sculpture. This links him to the Harrison star compass he is holding in his hand. The angle of the compass is to reflect the heavens. His hair is slightly stylised into question marks. "He is of a very inquiring mind, so beginning at his questioning head, questions tumble down past a querulous eyebrow, down a pointed nose, flow from the stock's river of knowledge, roll down a Harrison arm, to be stopped and reflected by a heavenly reflected surface. A star is incised into his pupil to feed the questions back into his head, thereby completing the circle." In Longitude, the figure's attitude is taken from a portrait painted by Thomas King in 1768 when Harrison was about 73. It shows him triumphant, holding a pocket watch which is resting on a scroll inscribed with a drawing of the clock mechanism. Howard portrays him as a country carpenter aged about 30. He carefully studied King's portrait's bone structure, together with an enamel paste portrait by James Tassie, and compared them. He also studied pictures of Harrison's descendants. He left the legs slightly sturdier than life in order to balance the fullness of the blouse, reasoning that if they had been carved to size they would have looked spindly rather than curvy as befits a powerful man. They are modelled on the legs of footballer Jonathan Lowe. The carving of the blouse allows the arm to be traced all the way through as it touches the muscles. 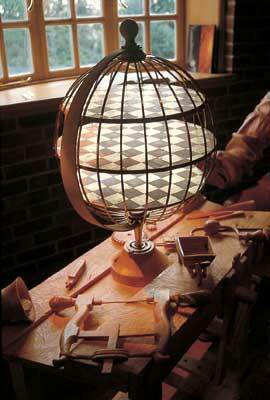 Howard adjusts scale where necessary by using the squaring system that was used by Leonardo da Vinci for enlarging his initial cartoons (sketches) proportionally. It works by constructing a grid of squares of a suitable size over the smaller design, then constructing a grid to cover the new scale and finally copying exactly what is contained in each square. In this way grids in grids can be used ad infinitum to replicate complex areas. "It may seem to be a long way round but I often do things in that way because it helps me think the matter through and get a general feel of things. Also, it highlights problems that may not have been so apparent at the concept." When the design is transferred to the pattern board, an elevation at 90 degrees is added to it. Howard explains: "I can then draw the plank thicknesses on one view and from that project across to the other profiles of the laminated 'slices'. Transferring these onto tracing paper, I now have an outline pattern for each slice. This allows the patterns to be juggled about on the timber for the best and most economical usage, and matching the boards accordingly." When this is established, and using the tracing paper pattern, the design can then be transferred directly to the timber and the outline carefully drawn on. This slice with all its parts is then numbered in sequence and marked for exact position in relationship to its fellows. The profile is then bandsawn. Howard likes to work in lime (Tilia spp.) because it is neither hard nor soft, is bland, good to work and holds tremendous detail. For the Harrison King work he used 75mm (3in) air-dried rough-sawn boards, as clear of knots, shakes and imperfections as was possible with lime wood. For constancy - vital when gluing and fitting - the boards were all put through the thicknesser together. Howard uses polyurethane-based glues which foam and penetrate the timber to form an immovable joint. "The disadvantages are that with it being the consistency of honey, when you do come to cramp up it creeps wildly and so can be difficult to exactly match marks up. This can be remedied by tacking in at points that do not matter, but nevertheless big pieces, with the tremendous pressures on them, can be absolute so and sos to do. The other thing is that these glues react with the moisture in the timber, so they also react with the skin. If you get it on your nails you have to wait for it to grow out! "These disadvantages are way outweighed by its strength and quickness. Half an hour under cramps and a joined board can be put through a planer-thicknesser. "Later on in the work, for emergency use I use the instant Superglues, of the two-pack variety. This means that should something drop off, usually because of a slight fault in the timber in a truly awkward place, I can, within a few seconds, replace and carry on working without losing much concentration." The tremendous pressures required on this sort of big work mean gluing and dressing each slice, then gluing the slices together, is not an option. Says Howard: "How it is done is to decide which is the most fundamental slice and glue and dress it up. Its adjoining boards are simply but accurately fitted and glued to it, one at a time." He adds: "It may seem to be a slow way, but experience has proved that is the only way, especially with the detail I like to employ. "His work is characterised by extreme attention to detail and intensive historical research"
Howard first had to deal with extreme size when deciding how to tackle the Hector Horses. "I was very worried about the stability of the construction. When I looked for comparable pieces to see how they were done, I could find little that covered the subject." The approach used by carvers of religious sculpture often got around this by placing such figures in niches and hollowing the figures out to create a shell that was not subject to the stresses and strains of a solid body. This, however, was not open to Howard as the horses are meant to be viewed from all angles. "I got around it by constructing the body of the beasts as a box, carefully organising the carving to be contained on the outside; the extremities of the limbs, tail and head being lesser lumps, followed the flow of the grain. "By and large, wood only shrinks across the grain so it is important that the flow is not contradicted. As long as that rule was followed, the work should behave itself, at least within acceptable parameters. This approach has worked particularly well and to date we have had no problems of that nature." The Longitude sculpture is also made entirely solid. "Using the rationale that wood only shrinks across the way, I merely blocked up and glued all pieces in one direction. Although the pieces are quite large, this effectively laminates it too and that of course helps relieve the stresses." Howard began carving by roughing out the general shape and then cutting in the basic folds on the body and garments, trying to achieve the difference between leather and cloth. He undercut the sleeve cuffs heavily, in some instances using specially made tools to do it, recalling that the undercutting of the jerkin involved depicting a buttoned garment that could be taken off. 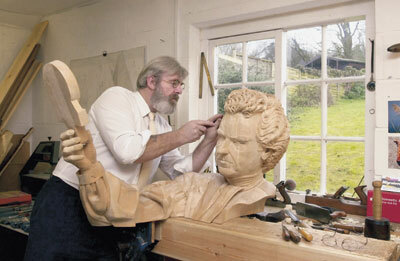 To carve the face, Howard had to put the bust on its back, upside down, and cradle its head in his lap, using a hand mirror to check that he was getting it right. 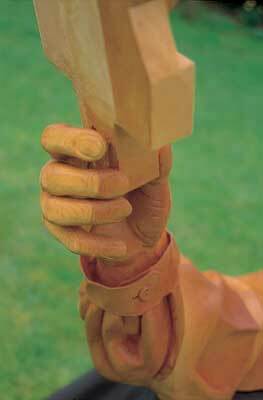 The hand resting on the left thigh took weeks to do, what with limited access and carving through and down the grain. Carving a sleeve detail, he noticed something silver beneath his carving tool - a 'shot corn' (lead ball pellet from a 12-bore shotgun) which would have been left in the tree by a hunter. The right-hand is carved so that visitors can shake hands with it. 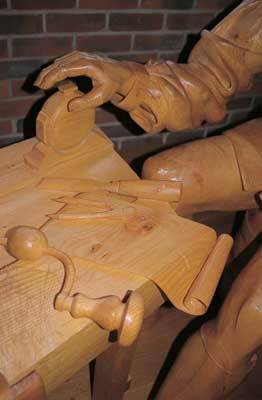 The bench and all its objects are carved from the solid, which also requires much under cutting. In all, the sculpture took more than 18 months to complete. 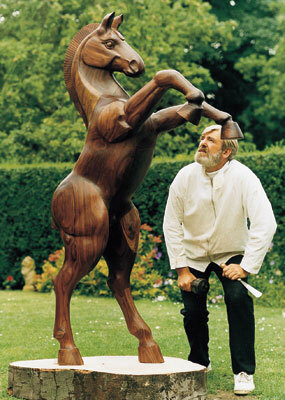 Could you be the next International Woodcarver of the Year?